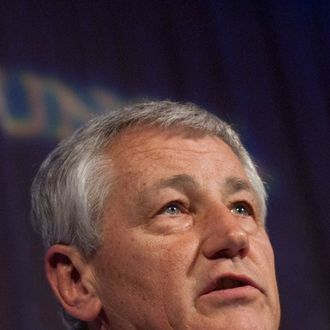 The criticism of Chuck Hagel feels familiar, though Susan Rice might have received a more vigorous defense. On Sunday the attacks on President Obama’s rumored pick for Defense secretary continued, with Joe Lieberman declaring on CNN’s State of the Union that he’d have “some really serious questions” to ask Hagel (if he was sticking around for the confirmation fight, that is). On Meet the Press, Lindsey Graham said, “I don’t think he’s going to get many Republican votes,” and even Democrats were hesitant to stand up for Hagel. On the same show, Chuck Schumer said he’d “have to study his record” before throwing his support behind him. Later Hagel got more bad news when the National Journal reported that a senior administration official said it was “fair” to say Obama is considering other candidates for Defense secretary. The White House never said Hagel was the only candidate for the job, but it still isn’t encouraging.